The Living with Cancer Together workshop offers tools for cancer survivors. It was developed and is taught by Amy Gundelach, RN, MSN, OCN, UNM Cancer Center. 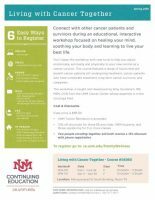 View the Living with Cancer Together Workshop Flyer for more information and to sign up.